Ronald McDonald House Charities of Alabama is embarking on a mission. We want you to know that your change counts!! Change counts at McDonald’s. Each time you give a little or a lot — it all counts toward a big change at RMHCA. Each customer has the opportunity to make their change count in a big way by dropping it in the RMHC Donation Boxes at each cash register. McDonald’s also makes their change count. With each Happy Meal or Mighty Kids Meal purchase, McDonald’s donates a penny back to RMHC to create change locally. Remember each time you don’t think your change will count, it does. It adds up to make a big change at RMHCA. 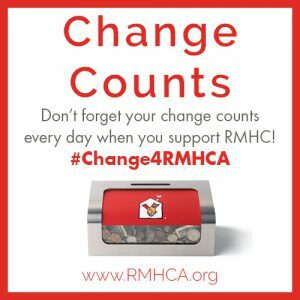 Change counts at RMHCA too. Each day, a change in the monitors at the hospital, the attitude of a caregiver or the change in a type of medicine can make all the difference to a family going through a medical crisis. Change in atmosphere counts when all you’ve seen is the inside of a hospital room for weeks. Change in your surroundings counts when you’re far from home. Change counts when you need it most. Join us in our Change Counts events — stay tuned to our events calendar to know when we will be at a McDonald’s near you and stop by to make your #change4RMHCA count. 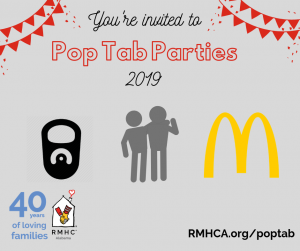 Our first Change Counts event will be at the McDonald’s on 5th Avenue South on Friday, June 10th, but there will be plenty more, so keep checking back!